A chronicle of developments in the space industry, updated daily. A Crew Dragon test article suffered an anomaly, a setback that could prevent SpaceX from sending people to the International Space Station before the end of the year. A lot of orange and black smoke appeared over an area of Cape Canaveral Air Force Station, specifically around SpaceX’s Landing Zone 1, where SpaceX was conducting a series of Crew Dragon engine tests. There are no reports of injuries. “The initial tests completed successfully but the final test resulted in an anomaly on the test stand,” according to a SpaceX statement. An independent report concluded that NASA has no chance of sending humans to Mars by 2033, with the earliest such a mission could be flown being the late 2030s. The report, while completed prior to the March 26 speech where Vice President Pence directed NASA to return humans to the moon by 2024, does offer insights into how much a lunar return might cost and how it fits into long-term plans to send humans to Mars. NASA contracted with the Science and Technology Policy Institute (STPI) to prepare the report, which Congress directed NASA to perform. STPI, at NASA’s direction, used the strategy the agency had laid out in its “Exploration Campaign” report, which projects the continued use of the Space Launch System and Orion and development of the lunar Gateway in the 2020s. That would be followed by the Deep Space Transport (DST), a crewed spacecraft that would travel from cislunar space to Mars and back. NASA would also develop lunar landers are related system to support crewed missions to the lunar surface, while also working on systems for later missions to the surface of Mars. Astronomers watched a high-speed gas cloud slam into the matter getting sucked toward Sagittarius A* — the supermassive black hole at the center of the Milky Way — and then zip away into space. Now, careful observations have revealed just how much the gas cloud, which astronomers named G2, slowed after the collision. That measurement tells scientists something important: the density of the hot matter surrounding Sagittarius A*, which is the nearest known supermassive black hole to Earth. SagittariusA* (SagA*) is quiescent, meaning it's not gobbling up a huge disk of matter and firing off jets. But there's still something hot and glowing surrounding it that physicists don't understand very well. The collision with G2 is offering astronomers one of their best clues yet as to what that glowing ring is made of. Intelsat announced that one of its communications satellites is now completely lost in orbit above Earth, rendering the vehicle an unmovable piece of space debris. Intelsat says that something damaged the satellite, causing its onboard propellant to leak out into space. Now, without the ability to maneuver and communicate, the satellite could pose a potential threat to other vehicles in the same orbit. For Intelsat, the most obvious consequence of the loss is a financial one. Built by Boeing, the satellite, called Intelsat 29e, cost between $400 and $450 million and was supposed to operate up to 15 years in space. But now its lifetime has been cut short after just three years in orbit, preventing Intelsat from receiving any planned revenue from the spacecraft’s communications coverage over North and South America. Starburst Aerospace and Techstars announced plans Feb. 12 to begin accepting applications for a new space-focused accelerator based in Los Angeles and backed by the U.S. Air Force, NASA’s Jet Propulsion Laboratory, Lockheed Martin, Maxar Technologies, SAIC and Israel Aerospace Industries North America. Lori Garver, former NASA Deputy Administrator, has teamed with leading environmental and space scientists to form Earthrise Alliance, a philanthropic initiative established to fully utilize Earth science data to combat climate change. Earthrise funds fellowships and awards grants to partner organizations that engage and activate educators, journalists, voters and decision makers. In addition, Earthrise provides partners with meaningful content, tools and applications derived from satellite data to inform the actions of these target communities. A city on Mars could provide the first-ever truly blank slate to organize a new kind of economy. While attempts to re-organize the means of production are as old as humankind itself, these experiments have always been limited to some extent by the economic systems that came before. People can only change so much so fast. Space exploration, and the establishment of new colonies, may be humanity’s first shot at creating an economy from the ground up. Its first settlers could opt for pure socialism — where all ownership was shared — just as easily as they could establish a city that enshrines property rights so much there are no other laws at all. Think about the dreaminess of twilight, when the sun has slipped below the horizon, and the darkening sky is streaked with dusky purples and blues. There, among the emerging stars and the silvery moon, lustrous as a pearl, you see it—an ad for a soda company. This was the future envisioned by PepsiCo, specifically the corporation’s division in Russia. According to a recent story by Futurism’s Jon Christian, the branch planned to launch an “orbital billboard,” a cluster of small satellites flying in formation, like migratory birds that want to sell you something. The ad would orbit more than 250 miles above Earth, at about the same altitude as the International Space Station. In the early morning and evening, little sails on the satellites, made of reflective Mylar, would catch the light of the sun and become visible to the ground. The artificial constellation, blinking a logo, would promote Adrenaline Rush, a PepsiCo Russia energy drink aimed at gamers. If you’re trying to come up with the best game plan for proving the existence of extraterrestrials, you’ve got plenty of options. Naturally, you want a strategy with a high chance of success, simply in the interests of time, money and a shot at the Nobel Prize. For nearly 70 years the scheme favored by most scientists has been to look for signals — radio transmissions. That’s the classic approach of SETI (the search for extraterrestrial intelligence), and frankly, it makes sense. Radio can easily traverse light-years, and the technology for detecting it is well known and highly sensitive. NASA has named a University of Colorado Boulder team a finalist in a competition to design a greenhouse for use on Mars. The annual NASA BIG Idea Challenge is set for April 23-24 in Virginia; it calls on student groups at universities across the country to develop solutions to vexing space problems. The 2019 contest is seeking innovative ideas for the design and operation of a Mars greenhouse. The students are putting the finishing touches on their entry before the final competition, where their written research and physical prototypes will be evaluated by a group of NASA experts. Margaret Kivelson is the new chair of the Space Studies Board (SSB) of the National Academies of Sciences, Engineering, and Medicine. She succeeds Fiona Harrison who stepped down in order to co-chair the ongoing Decadal Survey on Astronomy and Astrophysics. Harrison was the first woman to chair SSB in its 61-year history. Now Kivelson is the second. Ever since the space shuttle retired in 2011, NASA has been paying Russia for rides to the International Space Station. They’d hoped that dependency would finally end in 2019. But with its new lineup of flights and launch dates released this week, the space agency acknowledged they’re not quite done needing Russia’s Soyuz rockets yet. NASA will remain dependent on Russia for the next round of space station rotations. Thanks to delays in commercial launches by SpaceX and Boeing, which NASA has paid billions to ferry crews to ISS, the space agency is now settling on longer missions for their astronauts, who will continue to hitch rides on Soyuz rockets. In fact, the new long-term crew roster and launch dates for the next year does not list any flights on commercial launches. In the middle of China's Gobi desert sits a Mars base simulator, but instead of housing astronauts training to live on the Red Planet, the facility is full of teenagers on a school trip. Surrounded by barren hills in northwestern Gansu province, "Mars Base 1" opened on Wednesday with the aim of exposing teens—and soon tourists—to what life could be like on the planet. A stellar flare ten times more powerful than anything seen on our sun has burst from an ultracool star almost the same size as Jupiter. The star is the coolest and smallest to give off a rare white-light superflare, and by some definitions could be too small be considered a star. Flares are thought to be driven by a sudden release of magnetic energy generated in the star's interior. This causes charged particles to heat plasma on the stellar surface, releasing vast amounts of optical, UV and X-ray radiation. Two members of Congress from California are questioning the creation of the Space Development Authority (SDA). In a letter to Acting Defense Secretary Patrick Shanahan, Reps. Ken Calvert (R-CA) and Ted Lieu (D-CA) raised "strong objections" for taking missions away from the Air Force Space and Missile Systems Center (SMC), based in Los Angeles, to the new agency. A growing number of lawmakers are speaking out about the Air Force's upcoming launch procurement. In a letter last week, a bipartisan group of 28 House members asked Secretary of the Air Force Heather Wilson not to delay that Launch Service Procurement, scheduled for release later this month. The members are all supporters of United Launch Alliance, which has advocated for keeping the program on its current schedule. According to SpaceX, there's a 1 per cent chance that at least one of its satellites will collide with a piece of debris during its 10-year stint in the sky. But that calculation, given in a report to the US Federal Communications Commission (FCC), only incorporates trackable debris — pieces larger than around 10cm. Satellite operators can track where those pieces are and maneuver their equipment out of the way. And while the millions of tiniest bits — less than 1cm wide — are too small to track, colliding with them is unlikely to blast a satellite to pieces, said Samantha Le May, who is modelling the behavior of orbital debris for her PhD at RMIT University. NASA’s Wallops Flight Facility on Virginia’s Eastern Shore is scheduled to launch a resupply mission to the International Space Station this afternoon. The launch pad is one of two that sit at the edge of the Atlantic Ocean and a spot where rising waters and stronger storms believed to be fueled by climate change are eroding the shoreline. Inclusion in a trillion-dollar industry, support of more environmentally-friendly projects and involvement in cutting edge technology. These are just a few examples of the perceived benefits, should Oscoda Township become home to a spaceport operation. Gavin Brown – executive director of Michigan Aerospace Manufacturers Association (MAMA) – gave a presentation at the April 11 meeting of the Oscoda-Wurtsmith Airport Authority (OWAA) to discuss the possibility of bringing a launch facility, both vertical and horizontal, to the state. In attendance were representatives of Oscoda and AuSable townships, Phoenix Composite Solutions, the Oscoda-Wurtsmith Airport (OWA) and Kalitta Air, including CEO Connie Kalitta. Consensus from attendees was that such an endeavor would have a significant, positive impact on the community and surrounding areas. Oscoda has been named as one of the possible site locations for the Michigan Launch Initiative (MLI), and Brown explained that funding is being awaited which was approved by former Governor Rick Snyder. This is currently under discussion with Governor Gretchen Whitmer. Space tourism is here. It's real. It's not some outlandish vision of a distant future. Right now, if you have the money, you can pay to get in a spacecraft and fly around the moon and back. Of course, you don't have the money. That journey, with SpaceX, costs somewhere in the region of US$100 million, which is not the sort of change many people have to throw around. There's a Japanese man, Yusaku Maezawa, who does have that sort of change to throw around, and will undertake his interstellar journey sometime around 2023. For the rest of us, however, that will remain a dream. But that isn't where space tourism begins and ends. And for those looking for the next frontier, who are so obsessed with travel that they want to take this thing as far as it can go, the space travel experience is already possible. For those who are only stupidly rich, there's the chance to spend US$20 million and fly into orbit, before visiting the International Space Station. That Russia-led program is currently on hold, though it's hoped it will be resuming soon. Other orbital space rides are in the works, like the Aurora Space Station, in orbit by 2021. That date seems highly ambitious, but still, it's an interesting concept. The NASA TWINS Study represents the most comprehensive view of the human body’s response to space flight ever conducted. Results will guide future studies and personalized approaches for evaluating health effects of individual astronauts for years to come. As a cancer biologist at Colorado State University I study the impact of radiation exposure on human cells. As part of the TWINS Study, I was particularly interested in evaluating how the ends of the chromosomes, called telomeres, were altered by a year in space. One question often asked is whether Scott will return from space younger than Mark – a situation reminiscent of “Interstellar” or Einstein’s so-called “Twin Paradox.” However, because the ISS is not traveling anywhere near the speed of light relative to us, time dilation – or the slowing of time due to motion – is very minimal. So any age difference between the brothers would only be a few milliseconds. Even so, the question of spaceflight-associated aging and the accompanying risk of developing age-related diseases like dementia, cardiovascular disease and cancer – during or after a mission – is an important one, and one that we aimed to address directly with our study of telomere length. Officials from NASA and Blue Origin have signed an agreement that grants the company use of a historic test stand as the agency focuses on returning to the Moon and on to Mars, and America’s commercial space industry continues to grow. Under a Commercial Space Launch Act agreement, Blue Origin will upgrade and refurbish Test Stand 4670, at NASA’s Marshall Space Flight Center in Huntsville to support testing of their BE-3U and BE-4 rocket engines. The BE-4 engine was selected to power United Launch Alliance’s new Vulcan rocket and Blue Origin’s New Glenn launch vehicle – both being developed to serve the expanding civil, commercial and national security space markets. An Antares rocket soared into the afternoon sky over Virginia on Wednesday (April 17) carrying tons of NASA supplies — and 40 intrepid mice — to the International Space Station. The Northrop Grumman Antares rocket and its uncrewed Cygnus spacecraft launched into the cosmos from the Mid-Atlantic Regional Spaceport at NASA's Wallops Flight Facility, kicking off a two-day voyage to the space station. Liftoff occurred at 4:46 p.m. EDT (2046 GMT). The essential requirement for informatization is not lost on Chinese President Xi Jinping, who is making a determined effort to ensure that PLA modernization is complete by 2035 and that it results in a ‘world-class’ force capable of fighting and winning wars anywhere by 2050. Space capability and ‘space power’ are central components of PLA informatization and China is developing sophisticated thinking and capability for waging war in space. Future Chinese spacecraft will go beyond the Moon and fly to Mars and even deeper into space to reach Jupiter, the largest planet in our solar system, according to official plans. In a space exploration plan spanning the next decade, Beijing has set its sights on Mars and Jupiter. However, China’s Mars program made a bad start in 2011 when the Yinghuo-1, intended to be the first Chinese spacecraft to Mars to study its surface, atmosphere, ionosphere and magnetic field, disintegrated over the Pacific Ocean after its Russian ride to space failed to escape the Earth’s gravitational pull. Sun Zezhou, the chief architect of the Chang’e-4, which landed on the Moon’s far side, will also be responsible for the design of China’s new Mars probe. Sun revealed that the new probe, Yinghuo-2, would be similar to the Chang’e-4, but twice as heavy with a sizeable, autonomous rover, the Chitu, weighing about 200 kilograms. One of the goals of the mission is to search for evidence of both current and past life on the Martian surface, like biomolecules and biosignatures. We are rapidly moving towards colonizing other planets for human life: SpaceX, Blue Origin, and other smaller businesses in the space sector are all hoping to win lucrative contracts from the likes of NASA and other national space agencies to begin the colonisation process. Space travel is steadily becoming cheaper, easier, and more accessible thanks to advancements in technology, and some experts are claiming that we may be living on the Moon by 2030. And while we haven’t even set foot on Mars, there are already plans in place to colonize our closest planetary neighbor. Only a few years ago, the astronomy and heliophysics communities were skeptical about whether CubeSats could reliably obtain scientific data. But these breadloaf-size satellites have proven their ability to return useful data. Christopher S. Moore, a postdoctoral fellow at the Harvard-Smithsonian Center for Astrophysics in the Solar and Stellar X-ray Group, contributed to the twin Miniature X-ray Solar Spectometer (MinXSS) mission using CubeSats to measure soft X-rays from the Sun. These were the first solar science-oriented CubeSat missions flown for the NASA Science Mission Directorate. When will North Korea launch its next satellite? There hasn't been a launch since early 2016. Recently, boffins became interested in some new construction at North Korea's satellite launch complex, which suggested a launch could be ready soon. The failure of the recent US-North Korean summit in Hanoi to produce a positive result for North Korea could have also prompted a launch. And so we waited. This analyst expected that a launch could take place in time for North Korea's recent parliamentary meeting and birthday celebrations for North Korea's founding father, Kim Il-Sung. But nothing happened. This analyst also suggested that holding back on a launch could also be an effort to appease US President Donald Trump, and boost future chances of loosening economic sanctions against the country. Such considerations remain valid, and recent statements from North Korea suggest that international politics could be the driving force in keeping North Korea's launch vehicles grounded. If North Korea plans to give more time for negotiations to take place, then it also seems reasonable to assume that they will avoid provocations. The redeployment of the Sea Launch space launch venture from the US State of California to Russia's Far East may be discussed soon, a Russian space industry source said. "The possibility of relocating the Sea Launch platform to the Far East, specifically to the Sovetskaya Harbor, for launching the Soyuz-5 Light rocket is being considered," the source said. According to the source, if the Sea Launch continues to be located in the United States, it is almost impossible to launch a new Russian rocket from it, since the intergovernmental agreement between Russia and the United States provides for the launch of the Russian-Ukrainian Zenit rocket, which was discontinued in 2014. NASA's ambitious plan to return astronauts to the moon within five years has a target: the lunar South Pole. The Apollo missions of the '60s and '70s all landed around the moon's equator, but the pole has something very special those sites don't: ice, ice baby. "We know the South Pole region contains ice and may be rich in other resources based on our observations from orbit, but, otherwise, it's a completely unexplored world," NASA's Steven Clarke said. Big rockets tend to capture a lot of space enthusiasts’ attention, from NASA’s Space Launch System (SLS) to SpaceX’s Starship and Falcon Heavy. And to be sure, to get people to the Moon, Mars, and beyond, rocket engineers are going to have to think big. But it’s important not to discount the role that small — and even tiny — space craft will have in democratizing access to space and unleashing benefits for those of us who are unfortunately still stuck on Earth. Deterrence was the watchword among U.S. Air Force leadership during last week’s Space Symposium, and officials stated in strong terms that the United States is prepared to enact a show of force to prove its ability to respond to threats in space. “There may come a point where we demonstrate some capabilities so that our adversaries understand that they will not be able to deny us the use of space without consequences,” Air Force Secretary Heather Wilson said. Aerojet Rocketdyne says it’s committed to completing development of the AR1 rocket engine and is seeking potential partners for a new medium-class launch vehicle that could use the engine. Aerojet Rocketdyne received an award from the U.S. Air Force in 2016 to support development of the AR1, one of the engines ULA considered for use on its next-generation Vulcan rocket. The original value of the Air Force’s other transaction agreement, or OTA, was $804 million, with the Air Force providing two-thirds the funding and the rest coming from Aerojet and, to a lesser extent, ULA. Aerojet renegotiated that agreement with the Air Force in June 2018, decreasing the total value of the award to $353.8 million with the Air Force now providing five-sixths the total cost. Aerojet has said in subsequent regulatory filings that its own contributions to the award are now complete. ULA announced in September 2018 that it had selected Blue Origin’s BE-4 engine over the AR1 for Vulcan, a decision long anticipated by the space industry. Despite losing out on the Vulcan deal, Aerojet says it’s committed to completing development of the engine. Col. Robert Bongiovi, director of the Launch Systems Enterprise Directorate at the Air Force Space and Missile Systems Center, does not buy Blue Origin’s argument that the Phase 2 Launch Service Procurement program schedule favors some providers over others. The final request for proposals for the LSP will go out as early as this month, Bongiovi said. The Air Force needs to select two providers in 2020 to split national security launches 60/40 between 2022 and 2026, so any delays in the release of the RFP would jeopardize the Air Force’s ability to get both providers ready to launch payloads by 2022. That is the deadline when Congress decided the Air Force must stop flying the United Launch Alliances Atlas 5 vehicle because it is powered by the Russian RD-180 engine. The first meteor to hit Earth from interstellar space — and the second known interstellar visitor overall — may have just been discovered, a new study finds. Interstellar meteors may be common, and could potentially help life travel from star to star, researchers added. Scientists analyzed the Center for Near-Earth Object Studies' catalog of meteor events detected by U.S. government sensors. Spain's PLD Space, supported by ESA, has demonstrated the technologies for a reusable first stage of their orbital microlauncher, Miura 5. Miura 5 (formerly Arion 2) is aimed to provide dedicated launches for small satellites of up to 300 kg to low Earth orbit, in 2021. It weighs 14 tonnes at liftoff, and is powered by liquid oxygen-kerosene engines. The drop test was carried out at El Arenosillo Experimentation Center in Spain. The first 2019 launch of the Russian-built Proton-M carrier rocket with the Blagovest telecommunications satellite from the Baikonur Cosmodrome will take place on 23 May. Last week, another source said that the first 2019 launch of the Proton-M carrier rocket from Baikonur had been postponed from May 17 to 24-25 May. Budweiser has brewed a new limited edition beer in celebration of the 50th anniversary of the first moon landing. Discovery Reserve American Red Lager draws its recipe from a Budweiser blend that dates back to the time of the Apollo moon missions. "This Bud's for those who challenged the odds and made the impossible, possible. Budweiser Discovery Reserve is our tribute to this epic moment in history, one that will certainly continue to inspire generations of present and future explorers," said Ricardo Marques. Discovery Reserve is brewed with medium-roast Voyager barley malt and features a "light hoppy aroma, a toasted barley malt taste with a hint of toffee and a sharp finish," says Budweiser. The lager's reddish color is meant to be reminiscent of the next frontier for humans, Mars. The Discovery Reserve bottle and packaging was inspired by both the history and future of space exploration. A little more than three weeks have passed since Vice President Mike Pence tasked NASA Administrator Jim Bridenstine with returning humans to the Moon by 2024. Since then, the Oklahoman has been hotfooting around the country to build support—testifying before Congress, huddling with White House budget officials, speaking at major space conferences, and, this past weekend, visiting his alma mater, Rice University. Bridenstine is working to build political momentum to fund the plan. This involves developing an amendment to President Trump's Budget Request for fiscal year 2020, which will seek additional funding for the accelerated Moon program. Realistically, Bridenstine said, this amendment will be ready "by the end of the month." Much like plastic in our seas, debris in space has been steadily growing over recent years. 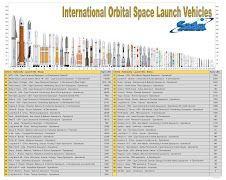 While many of these objects have either transited out of Earth orbit or re-entered Earth’s atmosphere and disintegrated, nearly 23,000 trackable objects currently remain in orbit. Given the significantly reduced atmospheric drag in higher Earth orbits, many objects will stay in space for decades, and in Geosynchronous Orbits (GEO) objects could remain in space for hundreds of years or more. The launch of SpaceX's Falcon Heavy heavy-lift vehicle is a major success for the US space industry but Russia is also developing its own launch vehicles with reusable elements, Russian Deputy Prime Minister Yury Borisov said. "Of course, we are working on it [projects on launch vehicles with reusable boosters]... And as for our [US] colleagues, we can only be happy for them, it is a great success," Borisov told reporters when asked about progress in the Russian project aimed at building the same kind of spacecraft. Bridgestone Corporation has announced that it will take part in an international space exploration mission together with the Japan Aerospace Exploration Agency (JAXA) and Toyota Motor Corporation. Recently announced by JAXA and Toyota, the goals of this mission are to expand the domain of human activity and develop intellectual property on space exploration. Bridgestone's mission assignment is to research the performance needs of tires for use on manned, pressurized rovers*1 in order to help these rovers make better contact with the surface of the moon. A major soft drink company says that, contrary to an earlier report, it won't advertise its products in space using a Russian startup. A report Saturday quoted a spokesperson for PepsiCo's Russian subsidiary who said the company was partnering with StartRocket to advertise an energy drink using satellites designed to fly in formation, displaying logos visible in the night sky to people on the ground. Similar claims have been made before, with NASA announcing in 1996 that it had found signs of life on Mars in another space rock, known as ALH 84001, also citing the appearance of the strands and filaments. A second Martian meteorite which shows 'signs of microbial life' has been found, Hungarian researchers say in their report on the latest study, published in Open Astronomy, reigniting 'bacterial' fossils claims made 20 years ago by NASA. Helical Communictions Technology (HCT), a Space Coast-based developer of deployable space-based and ground station antennas, recently achieved a milestone when their custom-built Quadrifilar Helical Antennas were launched as part of Hiber’s nano-satellite constellation. The first two antennas were launched at the end of 2018 from Vandenberg Air Force Base in California and the Satish Dhawan Space Center in India. Hiber, based in Amsterdam, contracted for HCT's antennas for their cubesat-based internet-of-things (IoT) network, intended to cover 90% of the world which currently lacks network access. The company expects to launch more of the satellites within the next year to meet customer demand. HCT designed and manufactured the innovative antennas at their Rockledge-based facility. In August of 2016, astronomers from the European Southern Observatory (ESO) announced the discovery of an exoplanet in the neighboring system of Proxima Centauri. The news was greeted with considerable excitement, as this was the closest rocky planet to our Solar System that also orbited within its star's habitable zone. Now, Harvard physicist Daniel Jafferis has a dose of good news and bad news for fans of the sci-fi staple: wormholes exist, but they’re unlikely to serve as galactic shortcuts. “It takes longer to get through these wormholes than to go directly, so they are not very useful for space travel,” Jafferis said. He and his co-authors used quantum field theory tools to show that wormholes could exist and that wormhole travel is possible — but rather than being a shortcut, it’d be a longer path between two points. For U.S. citizens, there's no escaping Tax Day — not even if you've left planet Earth. Millions of Americans are expected to have filed their taxes for 2018 by midnight tonight today, and the three NASA astronauts currently living and working at the International Space Station are no exception — even if they are orbiting 250 miles (400 kilometers) from the nearest H&R Block. It’s an audacious goal and a laudable one. And its achievement will require creative thinking and a departure from “business as usual.” But using this challenge as an excuse to abandon technologies that are already close to fruition will unreasonably increase risk, both to our astronauts and to the investment in our future in space. NASA would like you to take a picture of a tree, please. The space agency’s ICESat-2 satellite estimates the height of trees from space, and NASA has created a new tool for citizen scientists that can help check those measurements from the ground. All it takes is a smartphone, the app, an optional tape measure, and a tree. Launched in September 2018, the ICESat-2 satellite carries an instrument called ATLAS that shoots 60,000 pulses of light at the Earth’s surface every second it orbits the planet. “It’s basically a laser in space,” says Tom Neumann, the project scientist for ICESat-2 at NASA Goddard Space Flight Center. By measuring the satellite’s position, the angle, and how long it takes for those laser beams to bounce back from the surface, scientists can measure the elevation of sea ice, land ice, the ocean, inland water, and trees. Knowing how tall trees are can help researchers estimate the health of the world’s forests and the amount of carbon dioxide they can soak up. I’m excited to be teaching a course in Space Entrepreneurship for the new ISU Center for Space Entrepreneurship at Florida’s Kennedy Space Center Vistor Complex this summer. Being out at KSC with the Florida Tech and International Space University team behind the endevour got me thinking about the growing need for the sort of students that ISU produces and what an amazing impact they have had on my favorite industry. Commercial space startups are now far and away the fastest growing sector of the aerospace industry. Space Angels reports that over $3 billion was invested in 2018 alone and cumulative commercial space investment is now at $18 billion. Morgan Stanley, Goldman Sachs, Deloitte and Bank of America all project a space economy in the trillions. The array of innovative technologies and creative business plans is quite literally astronomical. But if any principle in the investment community can be called “axiomatic”, it is that investors place their bets on the people, not on technologies or business plans. Technologies-market fit is notoriously difficult to get right and business plans are just always wrong the first time. The core booster from the Falcon Heavy rocket that launched Thursday from NASA’s Kennedy Space Center in Florida tipped over in rough seas after landing on an offshore drone ship, SpaceX officials said. The Falcon Heavy’s core booster touched down around 10 minutes after the Falcon Heavy blasted off from Florida’s Space Coast, and moments after the rocket’s two side boosters returned to landing onshore at Cape Canaveral Air Force Station. A fragment of a cometary building block has been found inside a meteorite that broke away from an asteroid. The rare discovery provides a critical insight into the formation of the solar system over 4.5 billion years ago, and how it evolved into what we see today. When the sun first formed, it is believed to have had a cloud of gas and dust. Gravitational forces clumped much of this together to form the planets. The rest made up the moons, dwarf planets, asteroids and comets. The difference between the latter two relates to composition—asteroids tend to be made of metal and rock while comets are made up of ice, dust and rocky material. Comets are normally found farther away from the sun, in the colder parts of the solar system. Meteorites are bits of asteroid that have broken apart from their parent body during collisions in space, which then survive the journey through the Earth’s atmosphere and smash into the planet’s surface. Because meteorites are largely unchanged since their formation, studying them allows scientists to understand what these early conditions were like when the solar system was created. Picture a world where rain falls, gathers in lakes and ponds, seeps into the surrounding rock, and evaporates away, only to fall again. There's just one catch: The world is Saturn's moon, Titan, where the rain isn't water; it's liquid methane. Two new papers explore how this eerily familiar, waterless "water cycle" manifests on Titan's surface. To do so, two separate research teams turned to data from the Cassini mission, which ended its stay at the Saturn system in September 2017. The spacecraft flew past the massive moon more than 100 times, gathering crucial observations of this strange world as it did so.